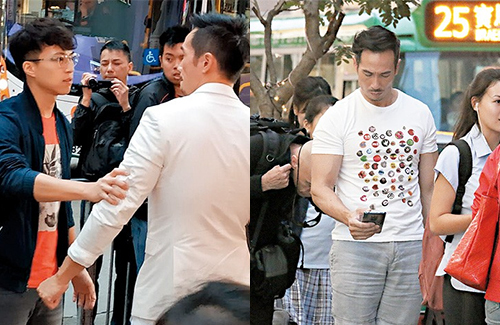 Moses Chan (陳豪) and James Ng (吳業坤) filmed a quick scuffle for the TVB drama Assassin <殺手> earlier this week in Causeway Bay, attracting a large crowd of bystanders. The TVB drama, which follows a line of retired hitmen, also stars Wayne Lai (黎耀祥), Ali Lee (李佳芯), and Elena Kong (江美儀). In the scene Moses, who plays a seasoned assassin, gets stopped by James, who plays a cop. Unhappy with James’ pestering questions, Moses lashed out at him and punched him in the face, knocking him to the ground. Moses and James completed the entire scene in just two takes. Afterwards, Moses shot another quick scene with costar Li Shing-cheong (李成昌), which also attracted a decent crowd. After work, Moses quickly changed his clothes and waited to catch a cab back home. The 47-year-old actor happily complied when fans asked for photos. With Moses’ original contract with TVB ending sometime this year, many management agencies had reached out to sign Moses, including Louis Koo’s (古天樂) Sky High Entertainment. However, reports say that Moses has already extended his TVB contract to another eight years.